Several of you have written me recently asking for more posts on what used to be my bread ‘n butter: travel. If that’s you, keep your eyes here over the next few weeks, because I’m on my way to Nicaragua and Costa Rica! This is my way of fitting in adventure into my life. Having time and flexibility to travel is one of the big reasons I made the leap to solopreneurship. My three weeks away will be a working vacation, since I’m still serving my clients and growing my business. But I’ve set myself up to spend as much time as possible enjoying the trip by doing a ton of work ahead of time (including scheduling tweets for clients and writing newsletters and blog posts) and training my team of three fabulous part-timers to pick up some of the slack. Over the last few weeks, my computer dilemma turned complicated. Convinced that my super-small laptop was too small, and not wanting to lug around my 14-incher, I splurged for a new tablet plus keyboard. I actually wanted to buy a netbook, but apparently those are being phased out because tablets are becoming so popular. After much research, I bought an Asus Transformer Tablet and docking keyboard. Much to my frustration, that tablet wouldn’t work in WordPress; I couldn’t type into the browser or the app. Which was a total deal-breaker for me, since I work in WordPress not only for this blog but also for several clients. So back to Amazon it went. Now my mini-laptop gets to make the trip. My Kindle, which I’m traveling with for the first time. I’ve got a physical guidebook for Nicaragua and a Kindle guidebook for Costa Rica — interested to see which one works best. Rolled up sheet and small pillow. Neither are necessities, and that’s what I would’ve dropped if I hadn’t had enough room in the pack — but they packed in just fine. 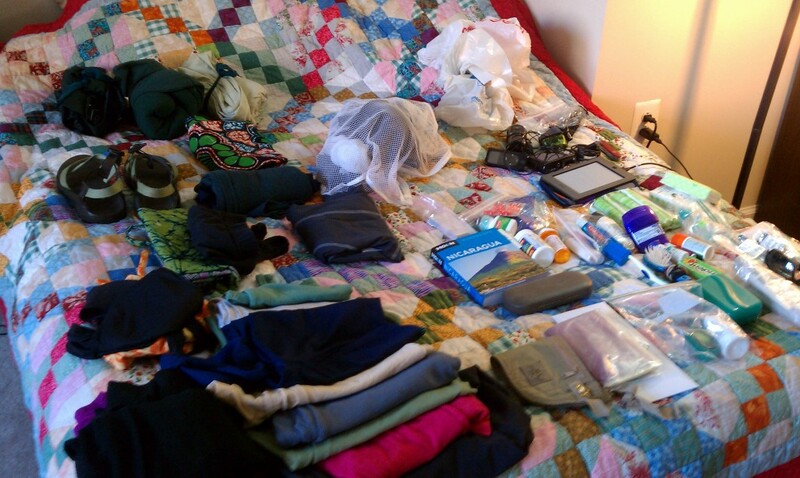 Lots of plastic baggies — and I put even more of my belongings inside baggies while stuffing all this into my pack. Baggies are a backpacker’s friend; they keep everything nice and dry, and prevent liquids from spilling onto all your clothes. Cipro, an antibiotic that cures stomach ailments. You need a prescription from your doctor to get it, but I don’t travel to developing countries without it. My beloved headlamp, which comes in handy in all sorts of situations — not just when you’re without electricity. I use this sucker to read on the bus, navigate dark streets and rustle through my pack in early morning hours without waking up the entire hostel. I’m looking forward to the spontaneity of travel, to meeting new people and learning new things, to discovering new places and having new experiences. And to see home with refreshed eyes when I get back. Watch here for photos and updates! Wow you are an incredible packer! Excellent! Look forward to seeing your traveling adventures. I have to be honest…I was nearly ready to unsubscribe because your blog drifted away from the interests that brought me here in the first place. I think your current info is awesome, but not quite the right fit for me. But… here we are back at the beginning. I’m excited. I post Travel Tuesdays on my blog. Maybe something like that will work for you, too? Oh have the best time. And you are an incredible packer. Can’t wait to hear about your adventures. Tasmania and Thailand are calling me this year! Just discovered this blog through Joanna Penn. I can’t believe you live in my hometown! Will definitely keep up and become a reader. Be safe in Central America! A brilliant blog about writing AND backpacking?! Can it be true? I’ve been wondering how I may (or may not) maintain my blog next year – traveling for 12 months through the Mediterranean and Sth America. I’m thinking of radically changing the nature of my posting to make it possible to keep blogging at all. I’ve quickly realized my partner’s iPad won’t cut it – but don’t want to buy a separate laptop – *another* something to carry. Hmm…. your not the only blogger to have this debate! 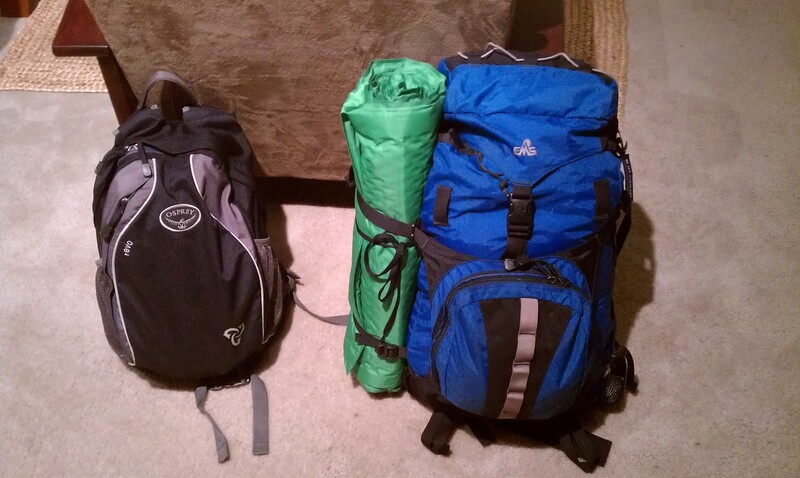 Your pack is looking pretty compact there in your pic… how heavy is it once your all set to go? Cipro- good call- broad spectrum antibiotic. It just probably saved my mom’s life during her trip to Mexico. My petzl headlamp is one of my favorite things I own. I look forward to hearing of your travels- stay safe! I’m allergic to Cipro. Would Amoxicillan do? I. Always write on the road and I finally bought an iPAD to make my bag lighter. I have spent some time in the countries you are visiting, you will have a great time. Guess what I had to go down the street to the local Thai doctor and get today? Yup. Cipro. Sigh. Happy travels, Lexi. Can’t wait to read more about your adventure and this “test” of your lifestyle (though I am confident you’ll get high marks!). I, too am thinking about swapping in my regular books for a tablet. PS: I’m a big fan of the two-backpack setup, also. One in my front, and one in my back. Always.